ZamZam, 2, runs circles around her aunt Hamdia Ahmed as Ahmed tries on her dress for the Miss Maine USA pageant at the apartkejt she lives in with her family in Portland. In the Miss Maine USA 2018 competition Ahmed became the first Muslim woman to compete in the pageant in Maine while wearing a hijab. Ahmed, who is Somali, came with her family to the United States from the Dadaab refugee camp in 2005. A photo of Miss Maine 2017 in the lobby of the Holiday Inn in Portland where the pageant was held. Hamdia Ahmed, at right, packs her suitcase before leaving for the pageant weekend surrounded by her family, from left, her nieces Muno, 10, and Naimo, 12, her older sister Arianna, and her niece, Zaytuun, 5. Ahmed said she decided to do the pageant for two reasons: to open doors in the modeling world, and to open doors for other Muslim hijabi women on the Maine pageant scene. “Representation matters,” Ahmed said. From left, Kaitlyn Beckwith, Hamdia Ahmed, Loraine Aceto and Lindsay Abrams, practice the opening number with their group before the first night of the pageant. Ahmed adjusts her hijab during a rehearsal with her group. Ahmed said that when she was little she always wanted to be the first woman to wear a hijab on the pages of a magazine, so she didn’t think twice about being the first woman to wear a hijab on the stage at Miss Maine USA. Miss Maine Teen USA contestants in the back room before going on stage. Miss Maine and Miss Teen USA are held simultaneously. From left, Brooke Harris, Miss Maine USA 2017, helps Ahmed practice her poses before the first night of the Miss Maine USA pageant. Ahmed had never competed in a pageant before being selected for Miss Maine USA and many of her fellow contestants helped her learn the poses. 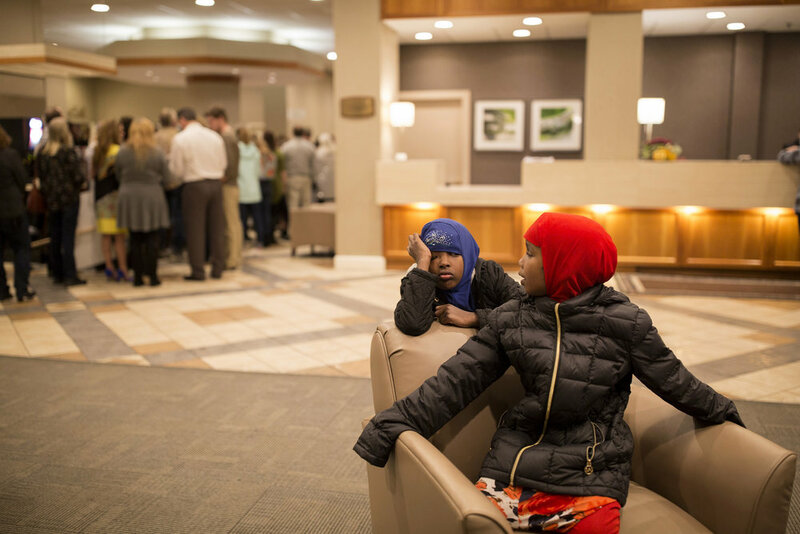 Hamdia’s nieces, from left, Jamila, 7, and Zaytuun, 5, wait in the lobby of the Holiday Inn for the pageant to start. Hamdia’s family, her mother sister and three nieces, paid the money to come and support her for both nights. Miss Maine Teen USA contestants lined up on stage during judging. Hamdia Ahmed smiles at her family off stage after competing in the first night of the Miss Maine USA pageant. Hamdia takes a moment to herself after a 12-hour first day of competition. Rileigh Jones shares a mirror with Ahmed as they get ready for night two of the pageant. Ahmed dons her burkini during the swimsuit portion of the competition. Ahmed's mother Mumina Ali smiles as she watches her daughter on stage competing in the pageant. Ali said she gave birth to Ahmed, her youngest child, in 1997 while fleeing violence in Somalia on foot. She walked with her four other children and newborn for three days after giving birth to make it to Dadaab. Ahmed and Miss Maine Teen USA winner Erin McPherson pass each other in the crowd after the end of the pageant. Ahmed didn’t place in the pageant, but she said competing was a positive, “life-changing experience” for her. Hamdia Ahmed leans down to give her niece Zaytuun, 5, a kiss as her family surrounds her to congratulate her at the end of the two-day Miss Maine USA pageant. Ahmed said that, most of all, she wanted other young Muslim girls, like her nieces, to know it was possible for them too. Ahmed and her family watch as Ahmed’s roommate Kaitlyn Beckwith, who was second runner up, has her photo taken in front of the Miss Maine USA sign.